Given a non negative integer number num. For every numbers i in the range 0 ≤ i ≤ num calculate the number of 1's in their binary representation and return them as an array. For number 2(10), 4(100), 8(1000), 16(10000), ..., the number of 1's is 1. Any other number can be converted to be 2^m + x. For example, 9=8+1, 10=8+2. 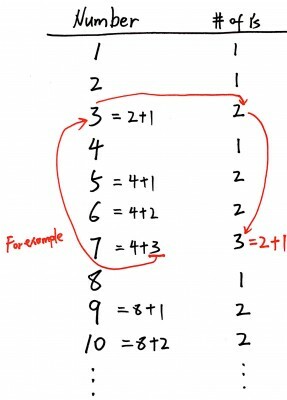 The number of 1's for any other number is 1 + # of 1's in x.